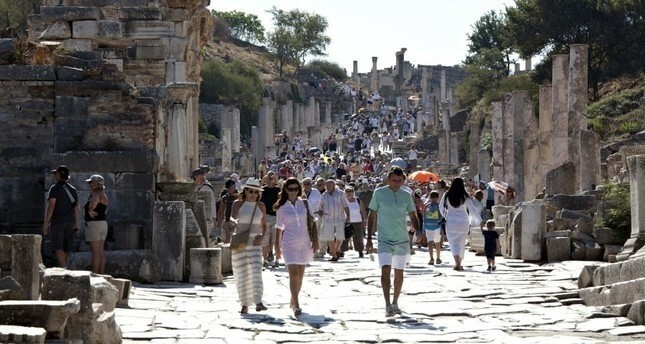 Tourists walking on İzmir’s Curetes Street, which is one of the main streets of Ephesus, connecting the Magnesia gate to the Koresos gate. The tourism sector, which has regained its strength thanks to tourism activities carried out by the country and the industry around the world as well as incentives and new investments along with the sector's non-governmental organizations, is getting ready to close 2018 with a record number of tourists. The summer season in tourism has not ended yet, Osman Ayık, Turkey Hoteliers Federation (TÜROFED) chairman said, emphasizing that September is one of the most productive months and that tourists from Europe and other countries continue to come to Turkey. "We are experiencing a season in line with our expectations. As Turkey, we are going to see over 40 million foreign visitors at the end of season," he noted. The TÜROFED chairman said that the industry expects the positive climate to continue next year as well, indicating that reservations at the moment were going very well. He confirmed that there was serious movement in requests for 2019. "Our expectation for 2019 is double digit growth. We hope that next year will be even better than this year in terms of revenue." Ali Kızıldağ, a member of the Board of Directors of the Professional Hotel Management Association (POYD), said that they are having a good year in tourism and that summer movements are still going on. Kızıldağ noted that they were receiving serious bookings every day because last minute bookings are very typical in the domestic market. "September is going very well. We already have preplanned congresses and meetings for October... This year will be a record year for tourism in terms of both the number of tourists and the amount of revenue. We are going through a year in which all the troubles experienced in 2015, 2016 and 2017 have been overcome. I estimate that an increase in the number of tourists in 2019 will be above 15-20 percent," he said. Meanwhile, the overall number of tourists coming to Turkey in the first seven months of this year was up 25 percent year-on-year, according to the Culture and Tourism Ministry. Turkey has targeted 50 million tourists and $50 billion in income by 2023, according to private sector representatives and officials. Turkey Travel Agencies Association (TÜRSAB) Bodrum Executive Chairman Yüksel Aslan noted that 2018 was a very fruitful year in terms of the accommodation sector and travel agencies. Occupancy levels are above the desired threshold, Aslan said, adding that the season was continuing with full speed and that situation in terms of both foreign as well as domestic market were looking very well. Suggesting that mobility in Bodrum, Turkey's most popular holiday destination, dubbed the Turkish Riviera, never stopped, and continued throughout the year, Aslan said winter sports contribute significantly to Bodrum tourism as well as sports such as golf, sailing, basketball and handball. Halil Özyürt, chairman of the Bodrum Hotel Association (BODER) also said the tourism season started to recover from last year and that it has caught the figures from 2015. The tourism industry has been going through a very good summer season, Özyürt noted. "We will continue to welcome our guests until the end of October. We have hotels that are open throughout the winter season. The 2019 season seems good in terms of the number of tourists that will come from abroad." Tourism is a sector that closes the Turkey's current account deficit, he continued. "I think we will catch the mobility from the 2013-2014 tourism season. As long as this sector recovers, it will also be beneficial for the Turkish economy."